Clifford Geertz (1926-2006) was perhaps the most influential anthropologist of our time, but his influence extended far beyond his field to encompass all facets of contemporary life. Nowhere were his gifts for directness, humor, and steady revelation more evident than in the pages of the New York Review of Books, where for nearly four decades he shared his acute vision of the world in all its peculiarity. This book brings together the finest of Geertz's review essays from the New York Review along with a representative selection of later pieces written at the height of his powers, some that first appeared in periodicals such as Dissent, others never before published. This collection exemplifies Geertz's extraordinary range of concerns, beginning with his first essay for the Review in 1967, in which he reviews, with muffled hilarity, the anthropologist Bronislaw Malinowski. This book includes Geertz's unflinching meditations on Western academia's encounters with the non-Western world, and on the shifting and clashing places of societies in the world generally. Geertz writes eloquently and arrestingly about such major figures as Gandhi, Foucault, and Genet, and on topics as varied as Islam, globalization, feminism, and the failings of nationalism. 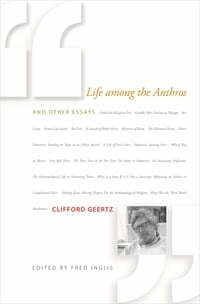 Life among the Anthros and Other Essays demonstrates Geertz's uncommon wisdom and consistently keen and hopeful humor, confirming his status as one of our most important and enduring public intellectuals.